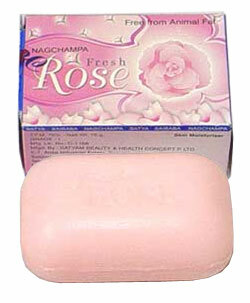 Nag Champa Fresh Rose soap can be used to revive a dull or oily complexion. It contains an infusion of Rose petals from fresh roses which gives coolness, calmness and freshnes to mind and body. This soap is an excellent skin toner, cleanser and mosturizer.